There are very few action franchises that have made it past 3 or 4 films, and even less than have made it to five or beyond, but the Fast and the Furious franchise defied all expectations and has made it to eight films (so far). This monumental feat is all the more surprising when you take into account that most of the films in the franchise are actually good. The series started out in 2001 with The Fast and the Furious, a Point Break rip off starring Vin Diesel and Paul Walker. From there we would be taken on a world tour in the next five six films. We would got down to Miami (2 Fast 2 Furious), Tokyo (The Fast and the Furious: Tokyo Drift), Mexico (Fast and Furious), Rio (Fast Five), London (Fast and Furious 6), and Abu Dhabi (Furious 7). 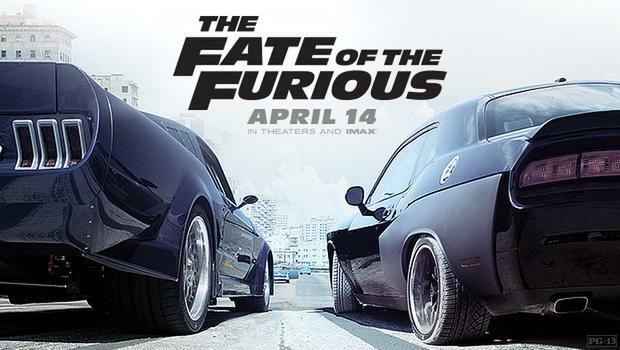 This franchise just keeps getting bigger and bigger and with the release of The Fate of the Furious, I don’t think that the series can anywhere but down. Going into this film I had high hopes. For the past 15 or so years, I have been entertained by Vin Diesel, Paul Walker, and the rest of the crew (except for Tyreese who is the worst thing that can happen to any series). As the films got bigger and bigger and more ridiculous, I couldn’t do anything but smile. These are the types of films I like. You don’t have to think about anything. You just sit there and become absorbed into whatever wacky antics the film brings you. I had always been a fan of Paul Walker. From his days as the boyfriend who gets turned into a dinosaur in Tammy and the T-Rex to his best film ever Running Scared (I am not kidding. Seek this film out at once. You will not regret it.) I always liked Walker in the Fast and Furious films. Sure, his acting isn’t the greatest, but his heart is always in the right place and that counts for a lot. The filmmakers of Furious 7 did something that I have only seen a few times: they worked with CGI artists to put Walker into scenes that he wasn’t in or didn’t finish shooting. This has been done in the past. The Crow was one of the first films to do this after Brandon Lee died and Gladiator did the same for Oliver Reed’s character. None of these or other films had ever tried to do this with full scenes. They pulled it off and, except for a few shots here and there, you can’t tell where real Walker begins and CGI Walker ends. The series should have stopped with Furious 7. It was Walker’s swan song and it seemed like a great place to end the series. If they had we wouldn’t have gotten Fate and that would have been ok with me. The problem with Fate is that it takes the plot way too seriously. Diesel goes rogue and there are nuclear launch codes and everything, but the heart doesn’t seem to be there. There is chemistry with the characters, but the void that Walker left is still with this series and without Walker the film seems to drown. There are some big set pieces in this film, but we just don’t care. This is a film that is going through the motions. The actions scenes are we shot, but the excitement has left the building. What we are left with is an action film where you keep looking at your watch to see if the film will be ending soon. This is the worst thing that can happen to an action film as all that hard work putting these action scenes together is for naught. It is amazing that a film that has The Rock and Jason Statham can’t muster up anything more than bored gaze. Both actors are given room to shine and they are the highlights of the film. The rest of the cast say their lines and collect their bi-annual Fast and Furious paychecks. You know that you are bored with a film when, after being shown some of the most ridiculous things you have ever seen, a small little imperfection is what you notice. The Fate of the Furious isn’t the worst film in the series (that would belong to 2 Fast 2 Furious), but you can tell that the ship has begun to take on water. If something isn’t done, then the series will drown before they can hit their goal of ten films in the series. I hope that isn’t the case as I like this series, but Fate isn’t doing anything good for it.